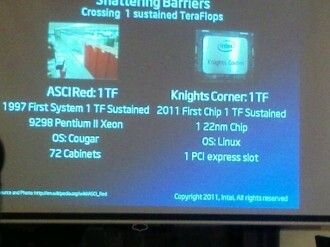 Intel has revealed a new processor with more than 50 cores at the SC11 supercomputing conference in Seattle. The groundbreaking chip was running in a test machine and is capable of crossing the 1 teraflop, or a trillion floating point operations per second, performance barrier. To put that into perspective, Intel unveiled the first supercomputer to cross the 1 teraflop mark in 1997. That system was comprised of 9,298 Pentium II processors that filled 72 full-sized cabinets. In comparison, the new processor called Knights Ferry is about the size of a matchbook and can achieve the same level of performance. Knights Ferry was designed in the Portland area and has just started manufacturing. The chip is based on Intel’s MIC, or Many Integrated Core architecture. Intel had a demo system running but reporters weren’t allowed to take photographs of it. In fact, the system wasn’t even in the same room as the presentation. An exact core count and power requirements weren’t disclosed either – all we know is that the 22nm chip features more than 50 cores and uses a PCI express slot. Production models of Knights Ferry are still a good ways out and it’s unclear if a version of the demo unit will ever find its way to consumer systems. It’s much more likely that Intel will use Knights Ferry technology to build the next generation of supercomputers. Intel and its partners hope to deliver said systems by 2018. Either way, Knights Ferry is extremely impressive from a performance standpoint and shows just how far processor technology has come in less than 15 years.